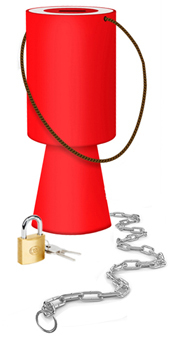 Our Collection Box Chains are an ideal way of securing collection boxes to tables, counters and bars in vulnerable public places. Available in a choice of lengths and assembly options allowing you to tailor-make the assembly to suit your requirements. Suitable for a variety of box shapes and styles including those with pre–moulded attachment points or boxes requiring drilling, where a split key ring can be fed through, or simply to create a loop around a tapered base and secure the box to a fixing point.